Our topic this term is based around the story "Pumpkin Soup" by Helen Cooper. This is a fantastic story about three characters; the duck, squirrel and cat, who are busy making some pumpkin soup. The story links in with friendship, hygiene and roles and responsibilities. 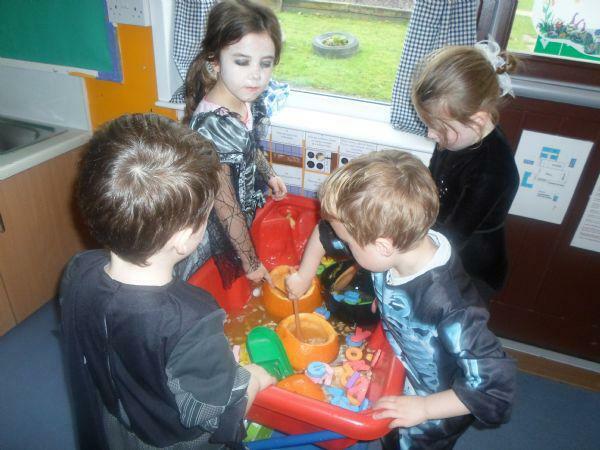 We currently have a "soup" water tray area filled with pumpkin seeds and measuring resources for the pupils to "make" their own soup. This has encouraged lots of free writing of taking orders and writing recipes. We hope to make our own soup towards the end of term and have a tasting afternoon with different fruit and vegetables.